Heartwood is a light to medium brown, commonly with an olive cast. Nearly white to light brown sapwood is not always sharply demarcated from the heartwood. Rift Sawn White Oak lumber has straight tight grain with heartwood that is a light to medium brown and commonly with an olive cast. The woods sapwood is nearly white to light brown and not always sharply demarcated from the heartwood. The principal uses for White Oak are cabinetry, furniture, interior trim, flooring, boatbuilding, barrels, and veneer. 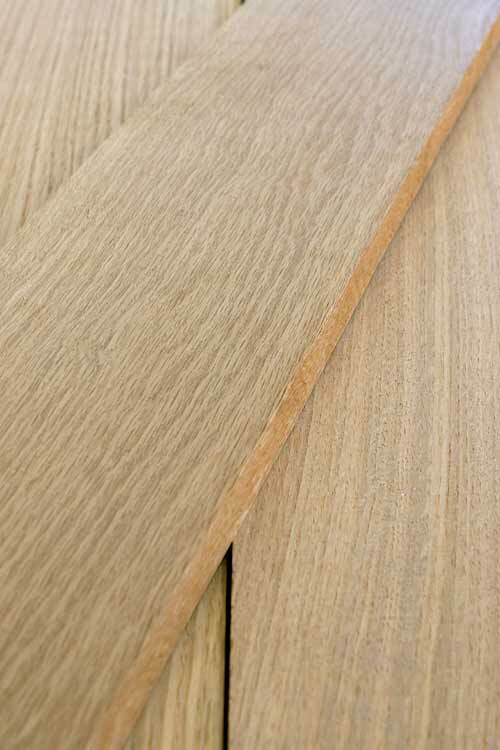 Similar to quarter sawn lumber, rift sawn white oak lumber is also referred to as radial grain. This cut produces the most stable boards. It is also the most wasteful to produce. To produce rift sawn boards the logs are cut radially perpendicular to the growth rings of the tree. For specific widths & lengths please add size requests in order notes at checkout. Available in 8 foot up to 16 foot in widths from 4 inches to 8 inches and wider. Generally you’ll get eight to ten foot lengths. Shipping this product via UPS limits us to 8 foot or smaller lengths. Produces good results with hand and machine tools. Has moderately high shrinkage values, resulting in mediocre dimensional stability, especially in flatsawn boards. White Oak can react with iron (particularly when wet) and cause staining and discoloration. This lumber responds well to steam-bending. It also glues, stains, and finishes well.